In addition to the futuristic rides, Discoveryland's Videopolis theater is the venue of one of the park's most popular shows - "The Legend of the Lion King" (come early if you want a seat). In sheer numbers of rides available, this land's a small one - but the rides have great "repeatability", and most are well equipped with FastPass stations. (2) Videopolis - no wait when there's no show in progress, of course! The theater is divided into two parts - the "good seats" for the show in the lower half, and tables with a view of the stage above. The tables are a great spot to stop for a bite to eat. There's food available - the typical limited quality / maximum price fare of the park. Looking for shade and a spot to crash while waiting for your FastPass slot? This may just be the ticket! (3) & (5) Arcade Alpha, Arcade Beta & L'Astroport Services Interstellaires - two video game arcades with futuristic themes. The first is in the lobby of the Videopolis theatre, the second at the exit for the Star Tours ride. (8) Les Mysteres de Nautilus - (the mysteries of the Nautilus) that's Captain Nemo's Nautilus, of course - as in 20,000 leagues under the sea. This is a great "walk through" attraction. You descend into the ground to cross "underwater" to the Nautilus submarine - parked in a lagoon in front of Space Mountain. Once on the ship, you tour through the Captain's stateroom, the grand salon, engineering, and more. Pause along the tour to peer out into the murkey depths as a giant squid attacks the ship. Great fun - but a little dark and "spooky" for the little ones until they've been through it a couple times. Oh - and it's a nice refuge from the summer heat too! (4) Star Tours - this is another attraction where the wait in line is almost as entertaining as the ride itself. The line queues through an "active" space port, where "R2 units" are making last minute repairs to spacecraft, C3P0 is commenting on the state of affairs, droids are being repaired in a busy workshop. You're finally ushered into the boarding area and onto your Starspeeder 3000, headed for the moon of Endor. Unfortunately, your robotic pilot Rex is a few lessons short of his commercial Starspeeder license, and before you know it, you've taken a wrong turn down a maintenance tunnel, landed in the middle of an astroid field, been very nearly sucked into an Imperial Star Destroyer, and finally, assist in destroying the Death Star... all before finally touching down, just a little shaken up, at your destination. I think Jad and Danna were both convinced that we actually shot up into space for a while... until the third or fourth time around when Rex still hadn't learned how to pilot his ship! (7) Space Mountain: Mission 2 - Take your seat and strap in - this coaster is one wild ride. You're first loaded into the space cannon - then shot off into "outer space" - flying through the dark past planets and moons before jerking to a stop 2 1/2 minutes later. You'll be inverted twice during the short ride - though it's a little hard to tell in the dark. Grab your FastPass for this ride - it's one of the Park's most popular. (9) Autopia - This is one of the few rides we didn't make it on - the line was always too long, and there was no FastPass option. If you make it through the line, you get to "drive" mini cars along a track. 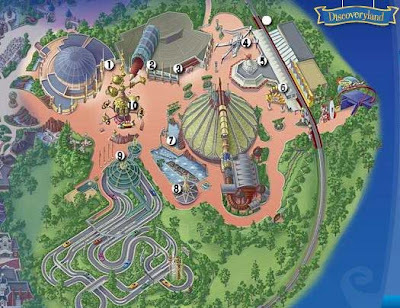 (10) Orbitron - Very similar to Fantasyland's "Dumbo" ride - just swap the flying elephants for flying space ships. Go up. Go down. Get out. The Once Upon a Dream Parade in neighboring Fantasyland is a great chance to avoid long lines on the park's most popular rides. Hit the lines for the rides like Space Mountain and Star Tours during the parade, and what can usually be a long wait turns in to a walk right to the attraction. "How long do you think it will take us to get to Disneyland?" I asked Jad last Saturday morning as we were packing up the car. "Hmm - maybe twenty minutes or so?" he guessed. No matter how fast the German autobahns, there's no way we were going to be able to drive the 620 miles across the heart of Europe in 20 minutes! Fortunately, our trusty Toyota 4Runner turned out to be just as adept at crossing the wide expanses of Europe as it was on the deserts of Oman. Not far from the French border, we stopped for the night at the Hotel Bremerhof in Kaiserslautern - a neat family hotel nestled in Pfaelzer forest outside of town. With a playground, a cute puppy, a spacious room and roast boar on the dinner menu, you couldn't ask for a better overnight rest stop! Next stop (four hours drive away) was Davy Crockett Ranch - just a 10 minute drive from Disneyland Paris, and our home for the next five days! Our little "log cabin" wasn't quite ready yet (check-in at 3:00), but our passes to Disneyland were, so we headed to the park. Parking at the park is no easy feat - with 12 million visitors a year, you have to have a LOT of parking spaces! 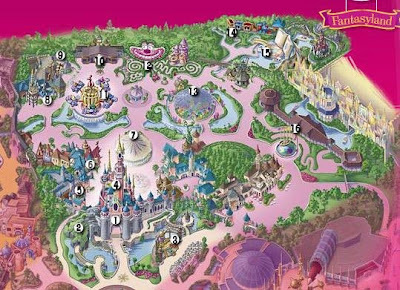 If you're lucky enough to get a spot in the first row of parking, it's still a 1/2 mile walk from there to the gates of Disneyland under the pink Disney Hotel. A series of moving sidewalks will take you part of the way - from from there on, you use foot power to get around! If you're staying at a Disney Hotel, parking is free - both at the park and at any of the seven Disney Hotels (since we arrived late the first day, we parked at the New York Hotel, and walked through Disney Village to the park). If not, plan on paying 8 Euros a day for parking. If you're coming in by train, it actually means less walking - the Gare de Marne la Vallee Chessy RER & TGV train station is located between the parking lot and the park entrance. Did Danna get to meet her "pwincesses?" Would Jad get to ride in a real live rocket ship? Would Kyler care where we were? Read on in the next couple entries for our review of Disneyland Paris - through the eyes of the kids (and their footsore parents). Click here to read on - about the Basics of Disneyland Paris.